Picayune is the largest city in Pearl River County, Mississippi. The population was 10,878 at the 2010 census. Picayune will be added to the New Orleans Metropolitan area in 2014 Located approximately from New Orleans, Hattiesburg, and Gulfport/Biloxi. The Stennis Space Center is 10 miles (16 km) away. 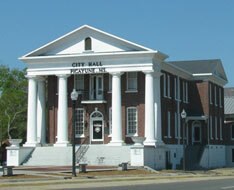 Picayune City Hall is located in beautiful historic downtown Picayune on the popular Goodyear Boulevard. The older building was designed by world-famous architect Wilfred Lockyer, known for helping design parts of the Titantic. The newer building was finished in 2013. Picayune city hall has been in the same location for more than 100 years!